Android Advertising Board M2 using A20 main dual-core chip, integrated two ARM Mail-400MP graphics processing unit, there is a strong video processing capabilities, compatible with most video formats and decoding capabilities. Onboard Android 4.2 operating system,1G of RAM and 4G of ROM,Can directly drive 15-55 inch LCD screen, and support for large-size infrared touch screen; 4 USB ports and 4 UART expansion ports, which can meet different customer needs; integrated RJ45 / WiFi / 3G in one, can be adapted to a variety of network environment. Meanwhile integrate more external functions, VIDEO input TTL camera, human infrared sensor, 4-way, both the timing and other hard-switch function. Multi-core performance is now a critical requirement of new consumer, home, and auto infotainment devices. As computing resource requirements increase, computing power must adapt in response. Applications like web-browsing, streaming video, gaming, and file sharing are growing in complexity as users require faster and more enjoyable content. Allwinner’s A20 processor, a dual-core Cortex™-A7 system, delivers a multi-core solution for tablets, smart TV, IPTV, and portable devices that effectively balances system cost, performance, and power consumption. The A20 processor is based on a dual-core ARM® Cortex™-A7 CPU architecture, the most energy efficient application processor from ARM®. 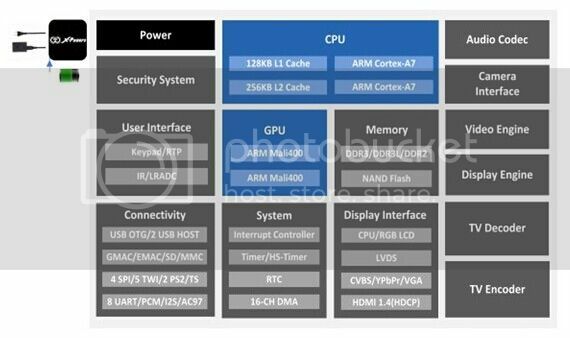 In addition, ARM®’s dual-core Mali400MP2 GPU enables both smooth UI transitions and fluid 3D gaming performance. A20 also enables a full HD video experience with H.264 1080p@30fps encoding and 2160p decoding. A20 gives customers superior advantages in system cost and time-to-market. A20 lowers system cost by integrating an extensive range of interfaces, codecs, and connectivity including 4-CH CVBS out, VGA, LVDS/RGB LCD, HDMI with HDCP, SATA, USB, GMAC, and audio. A20’s pin-to-pin compatibility with Allwinner’s previous generation A10 simplifies the product design cycle and enables customers to directly upgrade already-mature single-core platforms directly to dual-core. Ø Multi-format FHD video decoding, including Mpeg1/2, Mpeg4 SP/ASP GMC, H.263, H.264, VP6/8,AVS jizun, Jpeg/Mjpeg, etc. Package includes: A A20 advertising player board.